Ferrari and Hublot, leaders of their respective industries, have paired together to produce a series of commemorative watches sure to turn the heads of timepiece enthusiasts everywhere. Here are some keynotes on the new watch. As one would imagine, Ferrari and Hublot’s creations borrow design motifs from both of the company’s biggest hits — the Ferrari LaFerrari, F12 TDF and the GTC4 Lusso, representing the Italian auto-making legend. In addition, the Big Bang timepiece comes out strong in Hublot’s corner, providing a base design for the new line of watches. 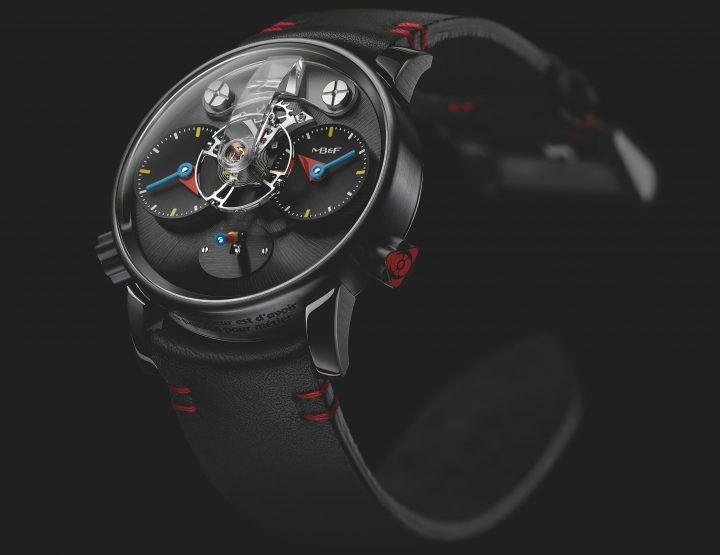 The minute and second hands, date window, and accents on the timepiece mimic the tachometer and other designs that call Ferrari’s flagship vehicles home. Naturally, other design elements from Ferrari’s famous fleet have made their way into the new lineup. 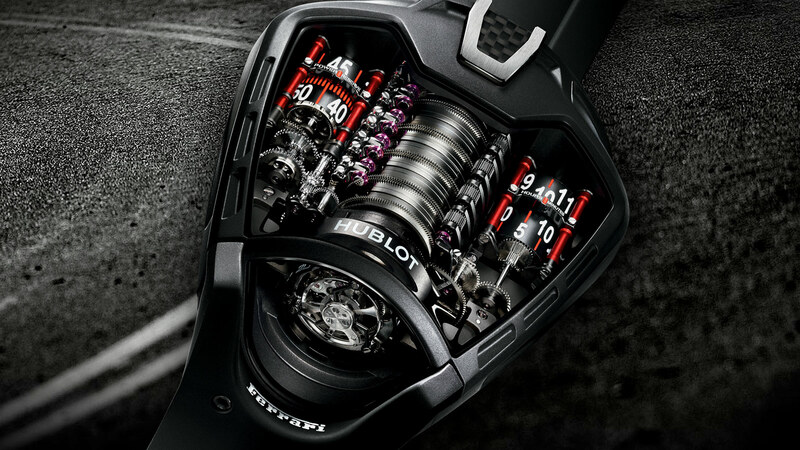 The Hublot MP-05 Laferrari, for example, looks a great deal like the engine and engine casing found on the back of today’s Ferraris. Flavio Manzoni, senior vice-president of Ferrari design, spoke about the happy marriage between the two companies, and discussed the synergy both organizations had while designing their trendsetting new pieces. Ferrari and Hublot’s mashup masterpieces probably won’t make their way to any kiosks in the nearest shopping mall. Their production is limited, and in the case of the higher-tiered models (the gold one, for example), only 500 will be released. That means getting your hands on one might be difficult — and only more so as time rolls on. Available in Titanium, Carbon Fibre, and Gold, the supercharged Hublot Big Bang variants will be priced at $26,200, $28,300, and $42,000, respectively. That’s not yet encroaching on Ferrari money territory, but it’s a hefty price point, and buys a whole lot of expert craftsmanship, pedigree, and Ferrari styling. Protecting the Hublot/Ferrari hybrid shouldn’t be much of a problem. It comes in a titanium case replete with its own unique set of features meant to make showing off the timepiece a cinch. Depending on the model that buyers opt for, they’ll be able to enjoy a crystal clear, protected spinning display that never leaves the case. It’s perfect for displaying the watch separate from other timepieces, where it should be — positioned to turn the most heads possible. If you’re a performance motorist, this is surely one of the hottest timepieces to have graced the market in a while. Any fan of Ferrari’s would find this piece to be simply irresistible. They can be a little difficult to hunt down, but if you’re the sort of person who’s already mucking about with the Ferrari brand, you can probably swing it.